And here is a good article explaining why he is so awful. Flitmus wrote: If you listen to him you will notice that Brigstocke hates a lot of people. He hates their consumption habits, their tastes, their ways of life. He hates their jobs and he hates the fact there are so many of them. He can’t understand why not everybody thinks he is right, which fits perfectly with the cultural elite in which someone like Brigstocke flourishes. They want tell the little people what to do. Petra Thompson wrote: Nothing drives me into a violent rage, except the sound of Radio 4 comedy. The bias in the factual programmes is bearable. But to hear the smug leftards laughing at the establishmen from their positions of safety (such as Bath and Brighton and Norwich) is more than I can bear. Chris Graham wrote: The embarrassing thing is, he is playing so safe and being so uncontroversial for the target audience that he is reminiscent of the comedians in the 70s who thought racism was funny. Brigstocke despises them, but he is no different. Nozza wrote: Exactly, he panders to their prejudices and strokes their smug, self-righteous egos. Tim Reed wrote: ...spewing forth views that are so predictably conformist that they could best be described as 'establishment', whilst at the same time pretending to be radical and subversive. Paul D wrote: You call him a posh boy. Being ex-public school and Bristol University he fits the label, but you wouldn't know it by his faux mockney accent. Miliband is another - the carefully cultivated glottal stop to show he's dahn wiv da peeps. Lefties cannot face reality - not even their own. Simon88 wrote: Like the proverbial files to a bucket of ***t, these sorts are attracted to the BBC. A left wing bias, plenty of public money to throw around and an agenda that fits. They all gravitate towards Al Sha-Beeb. I wouldn't mind if it was now and again - but it's relentless. 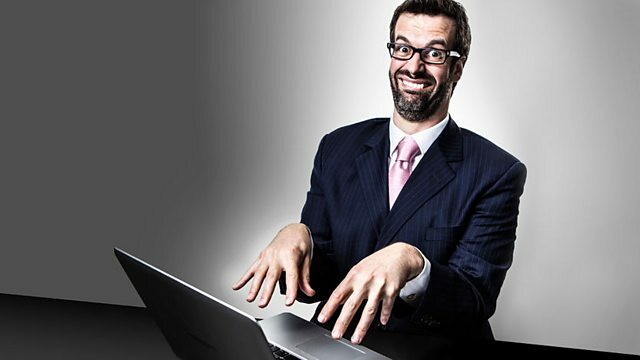 Arbit9 wrote: Brigstocke a comedian? Are you joking? Britain's oldest teenager. About as funny as a dose of the Black Death. ThatWentWell wrote: I think you've missed the point. Our Marcus is in fact a satirist and performance artist of genius. His working life is a piece of conceptual art - entitled 'Prat' I believe - in which he spends a career showing that a talentless, sanctimonious, no-mark can rise to national celerity as a comedian provided he parrots the correct sub-student lefty drivel. Think Marcel Duchamp meets Zoolander. Jono wrote: The Left had to use real humour back when it was the alternative to the establishment - now that it IS the establishment, its output is nothing more than propaganda aimed at its own survival. In it he catalogues his regular holidays to every far flung corner of the Earth "I went to the Maldives the year before last and stayed at the Reethi Rah and the Four Seasons Landaa Giraavaru; that was truly spectacular. I've also had some of my happiest holidays in Mallorca with family and friends.... " snowboarding in Val d'Isère, kayaking in Mexico, touring China and Cuba. The man must emit more CO2 than 100 average British citizens, and yet he lectures us about climate change and how we should all make do with less. The sickening smug g*t. ...I've just heard Steve Coogan on the radio - let's just say that he has really gone down in my estimation over the years. Coogan and Brigstocke are like peas in a pod. Coogan does seem to be very much the Champagne Socialist. What was he saying today? I tuned into Radio 5 (yes, I feel guilty) just before the Wimbledon Final, only to hear Coogan being interviewed (or fawned over) by John Inverdale. The questions were about "what Alan Partridge would make of Wimbledon". So Coogan spoke about "little Englanders" and how Alan Partridge's dream gig would not be Wimbledon, but rather a royal wedding - that's what "Little Englanders" like, you see. Coogan spoke as if "Little Englanders" were some kind of an elite, without realising that they're not. Smug champagne socialists like him are the ones who make up the elite*. They're the ones who should be the target of comedic derision and scorn, but we all know that we won't see anything on the BBC or Channel 4. * I realise that I don't have to point that out here. That's all so true, Charlie. Something that really puzzles me about the Left is how they simply cannot see that they are in charge, that they are the Establishment. As you say, they frequently bring out the "Little Englanders" canard as if those are people who wield some kind of power, and we should all be wary about them and keeping a close eye on their activities, while the Leftist opposition to them is constantly (so the Left's myth goes) weak and vulnerable and struggling. The whole thing is a lie and I just don't know how it is sustained. I can't understand either how people don't notice that "Little Englander" is considered an acceptable term when it is clearly aimed to belittle people based on traits associated with their nationality, and equivalent terms aimed at other groups would never be considered acceptable these days as the people who use slurs like "Little Englander" have made sure of it. Ditto, "white trash". I agree with both of you, and furthermore, as far as the term "little Englanders" is concerned, one never hears any talk of "little Welshers", or "little Scotlanders", does one? On the topic of Brigstocke and Coogan, such people, even as they move into middle-age, say that they favour 'transgression', because they believe that 'it's more interesting' (Coogan's exact words on the radio today, if I'm not mistaken). They wouldn't, however, want such transgression anywhere near their own families. And just as these supposedly edgy people claim to want transgression, they feel then that they can lambast 'little Englanders', who are staid, boring, 'conservative', and even.…..right wing. Shock horror. But these 'comedians' have painted themselves into a corner. And this comedic elite - smug hypocrites every last one of them - aren't even aware that they're in a corner. PS: All this lefty smugness reminds me of that youtube video - the one of the guy singing "The Daily Mail" song: all I have to do is say "The Daily Mail" and I've won the argument. To be fair to the guy who made the youtube video though, his video generated just as many laughs as listening to Brigstocke does: that is to say, none.